The Sun is one of the largest stars in our galaxy. It lies 149.6 million kilometers away from Earth. Unlike other stars, the Sun is not seen as a little point of light in the sky. 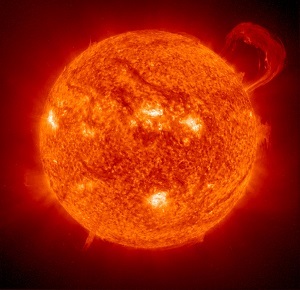 Made out of large amounts of gases—92.1 percent hydrogen and about eight percent helium—the Sun gives life to all creatures on the Earth. We see this important star so differently than many others because it's actually a lot closer to us than the majority of other stars. Even though the Sun is crucial for life, it can also be dangerous. Ultra Violet B (UVB) rays, that come from the Sun are damaging to skin. UVB rays could cause sun burns and cataracts, which is the clouding of the eye lens. On very sunny days, it is very dangerous to look straight at the Sun without protective glasses. If you do so, your eyes could get damaged or you might end up blind. Clearly, the Sun is necessary to humans in many ways, but it can also be very dangerous. The Sun helps keep us warm, provides light for plants to grow, and gives us solar energy to use for electricity.